Boundless describes the University of Toronto’s limitless potential for global leadership and impact. The University of Toronto is known for its unbroken legacy of excellence, its remarkable record of invention and innovation, its storied contributions to culture and sport, and its capacity to educate leaders and shape global conversations. U of T has produced 10 Nobel Laureates, four Canadian prime ministers, and leaders in every profession, from law, medicine and business to public service and the arts. Over the last century, we discovered stem cells and insulin, developed the electron microscope and chemical laser, and identified the genes that cause cystic fibrosis and early-onset Alzheimer’s disease. We also revolutionized the world’s understanding of mass media, redefined literary criticism, uncovered ancient worlds, and pioneered new techniques in fields as diverse as organ transplantation and computer graphics. Today the University of Toronto consistently ranks among the world’s best universities across an array of international rankings, and often in the top ten among public universities. This high standing speaks to the quality and character of our faculty, students and alumni, as well as the generosity of donors who support our highest ambitions. Boundless is the word we have chosen to convey the immense diversity and creativity of our community, its irrepressible impulse to cross boundaries and challenge convention, and limitless potential for global leadership and impact. Indeed, U of T is one of the very few institutions in the world with the breadth and depth of excellence to tackle timeless questions and make a real difference in addressing complex, global challenges. Our alumni community is more than 530,000 strong in some 190 countries. Our students come from 111 countries and more than 900 municipalities. We are situated within one of the most cosmopolitan cities in the world, where half of the population was born outside of Canada. U of T researchers actively collaborate with more than 1,200 institutions in some 950 jurisdictions around the globe. Together, we are creating handheld devices that detect disease in minutes, and developing novel treatments for cancer. We are pioneering the use of stem cells to regenerate damaged organs, treat blindness and reverse brain damage caused by stroke. We are giving new hope to families living with mental illness, improving childhood education, and confronting cyberbullying. Our community is working on cleaner forms of energy, reimagining the design and infrastructure of cities, and creating new technologies for environmentally sustainable societies. We are exploring the biggest questions about our natural world, investigating the complexities of the human experience, and contemplating our place in the cosmos. We are stimulating innovation, entrepreneurship and social enterprise to create prosperity and drive social progress. Being part of our community means having limitless potential to turn aspirations into reality. 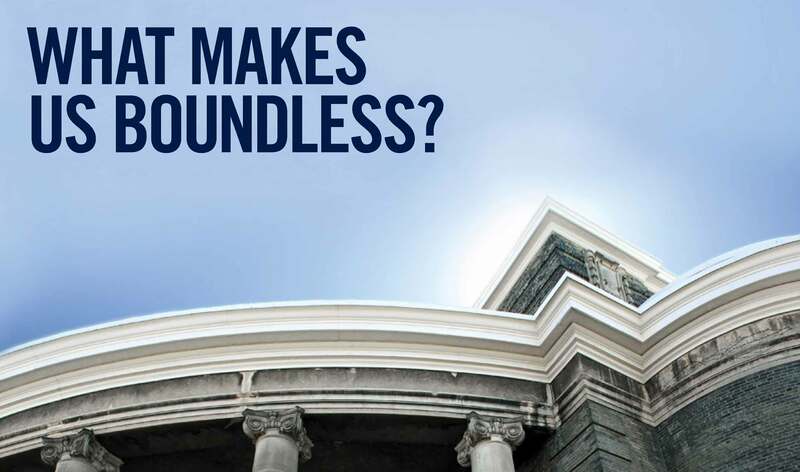 Boundless: The Campaign for the University of Toronto, with its historic $2 billion goal, is fuelling this vital work and opening up new possibilities for impact. Thousands of students, many of whom are the first in their family to attend university, are benefitting from scholarships and fellowships. Endowed chairs and professorships are enabling important discoveries. Exciting capital projects are creating new spaces for research, study and collaboration. Supporters across the globe are reconnecting with U of T to address the issues they care about. Philanthropy is moving us forward at a time when government funding is constrained and there is ­vigorous competition for the best students and faculty. The support of donors makes it possible to broaden access, pursue excellence and compete on the global stage. While our campaign has more milestones ahead, we are energized by our community’s shared belief in U of T’s future. Together, we are preparing the next generation of leaders and laying the foundation for a better world. How do we defeat cyberbullying?